One of my favorite grocery stores to shop is Trader Joe's. It has the whole picture of good food, ambiance, the smell of freshly brewed coffee along with something yummy for customers to sample that makes it so comforting. I am interested in checking out their shelves and buying something that is new. I often try something interesting from their pre made food section. 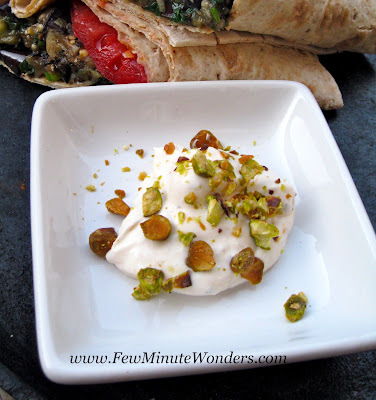 Last time I picked the grilled eggplant wrapped in lavash bread with tahini dipping sauce. 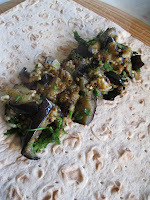 When I had it for lunch I decided to create my one version of this wrap. I picked up all the ingredients from TJ's to prepare this wrap for dinner. I substituted cabbage with tomato because I thought eggplant would pair well with tomatoes. Eggplant - 1 big sliced into discs. 1. Cut eggplant into 1/4 inch discs and coat it with 2 tbsp of oil and place it on a heated grill pan. 2. Allow it to get grilled on both sides and allow to cool before cutting the eggplant into strips. 3. Heat the wok with 1 tbsp oil and add the sliced garlic, cayan pepper, black pepper, salt dash of lemon juice, eggplant and mix well. Add salt to taste. 4. Add scallions and cilantro or parsley and mix well and remove from heat. 5. Place a lavash bread on a board. Add the eggplant in the center about 1/2 a cup and spread evenly along the center. 6. 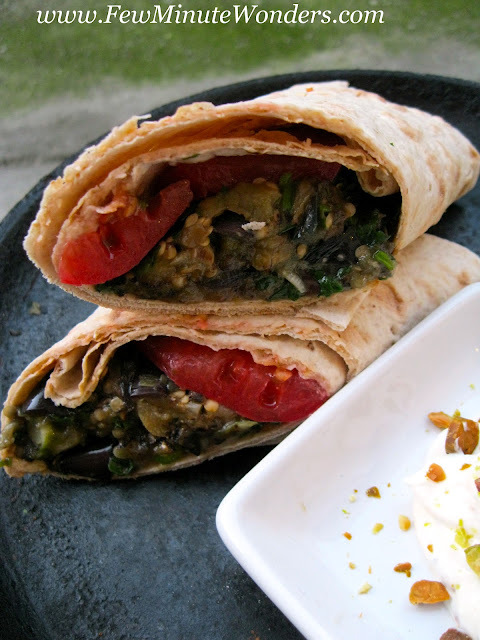 Place the sliced tomatoes over the eggplant and roll the lavash bread and cut diagonally in the center. 7. Place it on the grill to warm up and then serve it with the yogurt dipped sauce. 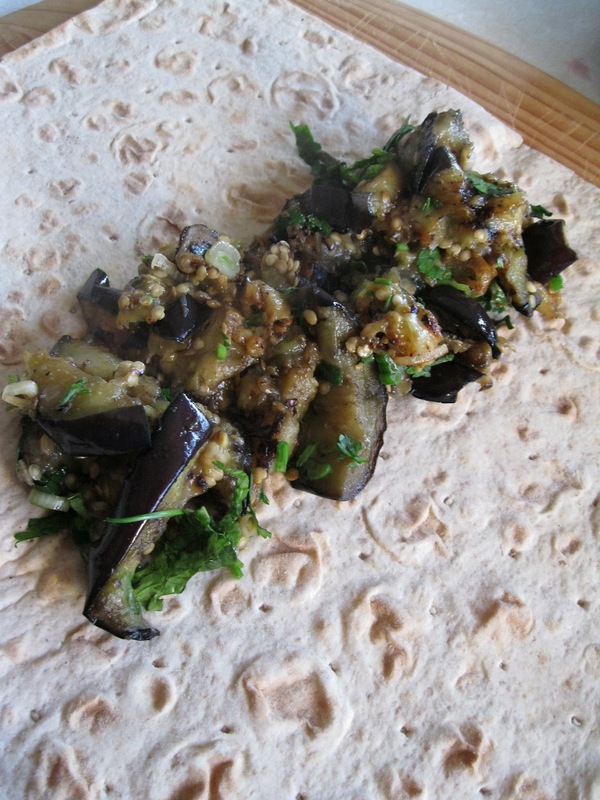 Eggplant in wrap is quiet new to me !! so healthy and delicious one !! The dip looks as super as the wrap.